A. How Are Sites Created? 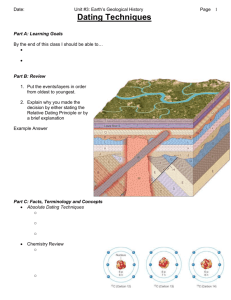 C. How Are Sites Found? 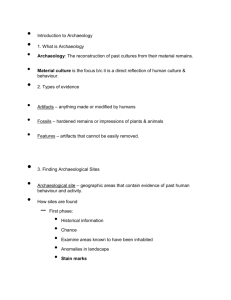 D. How Are Artifacts, Ecofacts and Features Recovered from Sites? B. What Can We Learn from Artifacts? C. What Can We Learn from Ecofacts and Fossils? D. What Can We Learn from Features? Copyright © 2009 Pearson Education, Inc., Upper Saddle River, NJ 07458. All rights reserved. answers (and usually more questions). The first step in answering questions is to propose a possible answer or a set of answers. operationalized (that is, made measurable through the archaeological record). data must be interpreted to determine what they mean. patterns and context rather than the intrinsic properties of artifacts themselves. 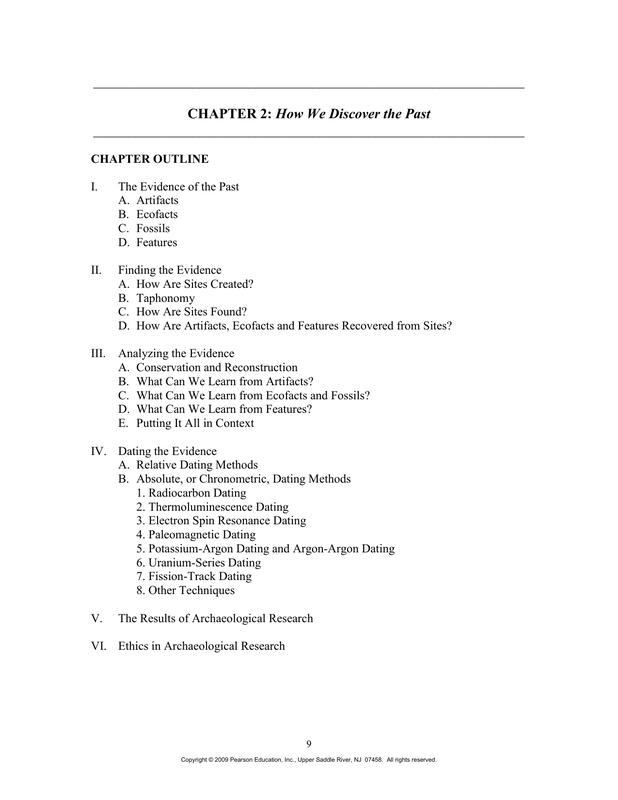 process of archaeological research all over again. 2. What are sites? How are sites found? 3. How is information about the past obtained? 4. How do archaeologists date material accurately? cultural change to be tested. What is the primary goal of archaeology? 6. What are the ethical considerations archaeologists must make? Why? similarities and differences of these two fields, using actual practitioners as examples. preservation, modeled after actual site preservation documents. 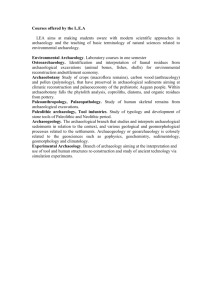 ethnoarchaeology, the direct historical approach, and underwater archaeology. 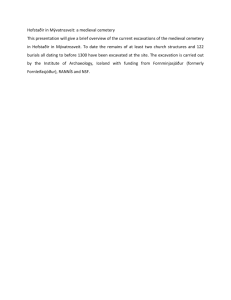 electrical resistivity, remote sensing, and aerial photography. drawbacks and their usefulness to archaeology and the study of human development. 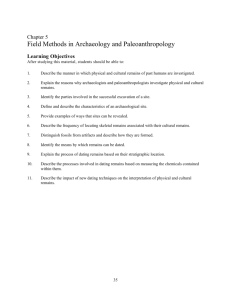 demonstrate how he or she uses concepts of archaeology correctly or incorrectly. University of Arizona’s Department of Anthropology. Why would they do this? World Wide Web Sites Your Students Can Use! Select a relative and absolute dating technique from the lists and describe each. on display at The Cloisters in New York City. methods of preservation, which involve the use of radiation for stabilizing materials. excavation of Pompeii is covered, along with work done by Mary Leakey in East Africa. Darvill, Timothy. The Concise Oxford Companion to Archaeology. McMillon, Bill. The Archaeology Handbook. (Wiley, 1991). Renfrew, Colin, and Bahn, Paul. Archaeology. Rev. ed. (Thames & Hudson, 1996). Scarre, Christopher, ed. Past Worlds: The Times Atlas of Archaeology. 1988. Reprint. Shaw, Ian and Robert Jameson. A Dictionary of Archaeology. Schnapp, Alain. The Discovery of the Past. (Abrams, 1996). 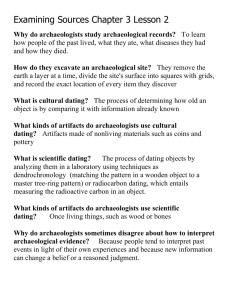 What kinds of artifacts do archaeologists use cultural dating?